Diana Donlon, director of Center for Food Safety’s (CFS) Soil Solutions program in the United States, spoke to the Soil Association at a lunchtime session about the necessity of improving soil health around the world. Diana Donlon began by highlighting that, despite excess carbon in the atmosphere being a daunting problem, carbon in the soil is an invaluable, but often depleted, resource. The world’s cultivated soils, however, have lost between 50-70% of their original carbon stocks and when soils lose carbon, they lose their ability to function properly. A key measure of soil health is levels of soil organic matter (SOM), which is crucial for long-term yields, food quality, extreme weather resilience, and as a vital store of soil carbon. Increasing the SOM level in degraded UK soils would provide better defense against flooding by reducing run-off, and would dramatically increase the yield and quality of food produced. Ms. Donlon quickly went on to underscore more uplifting news. She explained that we now know how to rebuild soil carbon by encouraging biological processes like photosynthesis that takes CO2 out of the atmosphere and stores it in the ground as soil carbon. Healthy soils act as a carbon sink by drawing carbon down into the soil to store it. Improving soil health is therefore a critical way to tackle climate change. In 2015, CFS made a short film to highlight the importance of soil carbon. “Soil Solutions to Climate Problems” was narrated by the well-known American author Michael Pollan and first screened at the launch of French Government’s “4 per 1000” initiative at the United Nations’ COP21. Both Center for Food Safety and the Soil Association are members of the “4 per 1000” initiative that aims to rebuild soil carbon stocks globally. Soil Solutions works on policy internationally via “4 per 1000” and in the US. Headquartered in San Francisco, Diana Donlon is actively involved in Californian climate/soil policy and helped to establish a “Healthy Soil Program” to provide financial incentives to California growers and ranchers to implement conservation management practices. California, with the sixth largest economy in the world, will be hosting a Global Climate Action Summit in San Francisco in September 2018. 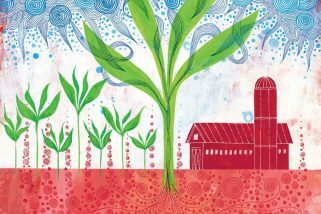 A key focus will be advocating the potential of healthy soils to draw-down carbon from the atmosphere. The Soil Association will be working to ensure that sustainable UK farming is represented at that summit and we will be collaborating with other pioneering groups (such as CFS’ Soil Solutions) to communicate the necessity to advance sustainable agriculture (including organic) as an important climate tool.